Our custom siRNA oligos are pre-annealed duplex and are purified by HPLC, which removes 100% of unpaired single chains. We provide low price and high quality. Researchers just need to dilute siRNA oligos intoDEPC H2O. siRNA oligo synthesis is completed in an ISO9000 certified facility; Products are precisely quantitated by spectrophotometer. Although siRNA oligos are stable in solution at 4°C for up to 2 weeks, it’s recommended to store siRNA solution at -20°C. Repetitive freezing and thaw should be avoided by aliquots. The recommended storage concentration is above 20 μM. The siRNA oligos stored under above conditions are stable for at least 6 months. The fluorescence-labeled siRNA oligos must be kept in dark. Technical data sheet is delivered together with siRNA oligo, including oligo name, sequence, concentration, the precise number of OD and nmols, Tm, MW, size, extinction coefficient and purification type. Provide your siRNA sequence, we'll synthesize it for you. 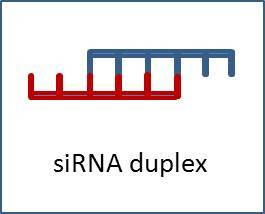 The siRNA oligo pairs (duplexes) are pre-annealed, HPLC purified, only need to be resuspended inDEPC H2O before use. 1 OD=2.5-3 nmol Shipping cost for all siNRA orders is $30.